If you're looking for a video transcoding product to compress your vacation vids, look to something other than the ultra-competent, but extremely pricey Sorenson Squeeze 9. 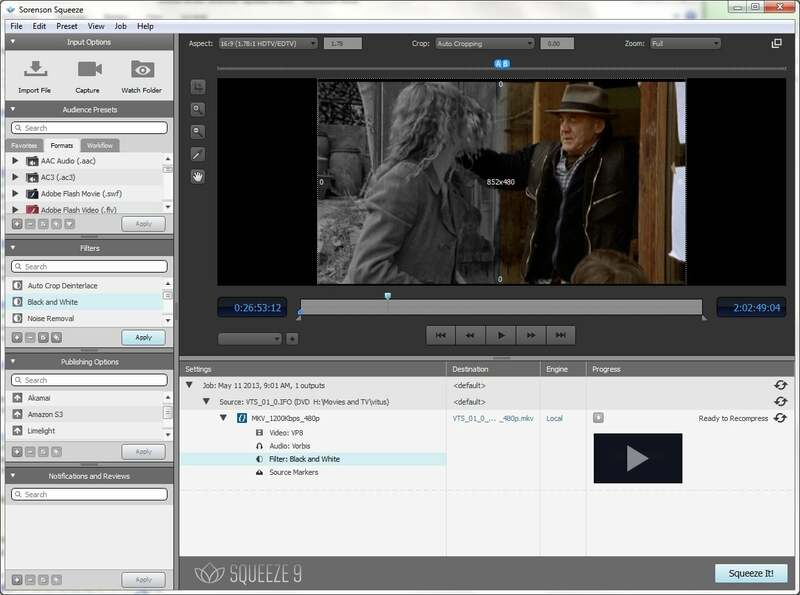 If however, you're a busy professional who needs to produce video in a variety of formats in the shortest possible time, Squeeze is what you're looking for. It's a fast, comprehensive, extensible, and highly configurable transcoder. The client program comes in three flavors: a $799 standard version, a $999 pro version, and a $2000 server version. Sorenson Squeeze 9's interface sports a host of minor improvements and some color to break things up, but it didn't need a lot of help in the first place. Here you see the side-by-side preview with a B&W filter engaged on the left. New to Squeeze 9 are support for HTML 5, an improved video preview window with side-by-side preview, a slightly improved interface…and more speed. The company claims three- to six-fold improvements, depending on the output codecs involved—and Squeeze supports a lot of those—from Main Concepts h.264 to Ogg Theora, and just about everything in-between. Also new is pre- and post-roll video for advertising headers or tags. 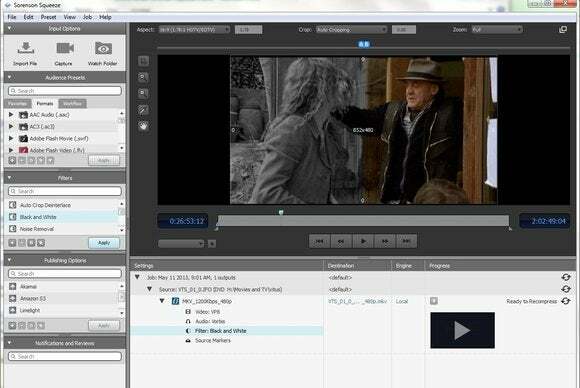 Closed captioning support now includes EIA-608 or EIA-708 and Quicktime timecode is now passed through. The Adobe Premiere plug-in has also been updated. Using Squeeze is a breeze. Simply open or drag the files you want to convert to the main window, select an output template, do the same with any FX or corrective filters you wish to apply, then click on the Squeeze It! button. Sorenson Media maintains an online library where you can grab more presets. You may of course also choose individual video and audio codecs and tweak individual settings such as bit rates, resolution, etc. on your own. Squeeze 9 supports nVidia CUDA GPU acceleration, but not AMD APP or Intel's Quick Sync. However, it will now take advantage of all the cores in your CPU. With the four physical and four virtual cores in my Core i7-3770 test bed, that meant very, very good performance. That meant transcoding a two-hour DVD to h.264 and aac in the background in about half an hour. Despite the heavy CPU usage, the rest of Windows 7 was still quite responsive. Despite the heavy CPU usage, Squeeze plays nice with your other programs. There was no noticeable slowdown in my Core i7-3770 test bed. The transcoding results with Sorenson, thanks to top-flight codecs, are nothing short of excellent, and the filters—such as black and white, sepia, auto crop deinterlace, etc.—produce very good results. Squeeze also supports VST plug-ins for audio. If you're a pro who does lots of encoding, Squeeze 9 is absolutely worth the price. The encoding is as good and fast as it gets. That said, it's an investment and casual users are better off with a free program such as Freemake Video Converter or Any Video Converter. Note: The Download button takes you to the vendor's site, where you can download the latest version of the software. Sorenson Squeeze 9 may be pricey, but you get what you pay for. If you rely on video conversion for your business, this is the transcoder to get.